While Thomas Kuhn’s theory of scientific revolutions does not specifically deal with validation, the validation of simulations can be related in various ways to Kuhn’s theory: (1) Computer simulations are sometimes depicted as located between experiments and theoretical reasoning, thus potentially blurring the line between theory and empirical research. Does this require a new kind of research logic that is different from the classical paradigm which clearly distinguishes between theory and empirical observation? I argue that this is not the case. (2) Another typical feature of computer simulations is their being “motley” (Winsberg in Philos Sci 70:105–125, 2003) with respect to the various premises that enter into simulations. A possible consequence is that in case of failure it can become difficult to tell which of the premises is to blame. Could this issue be understood as fostering Kuhn’s mild relativism with respect to theory choice? I argue that there is no need to worry about relativism with respect to computer simulations, in particular. 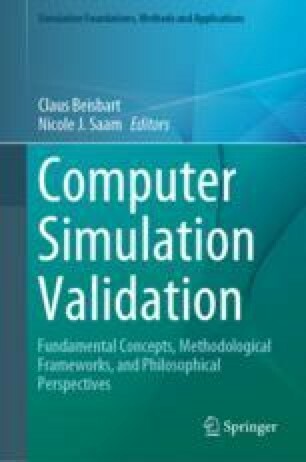 (3) The field of social simulations, in particular, still lacks a common understanding concerning the requirements of empirical validation of simulations. Does this mean that social simulations are still in a prescientific state in the sense of Kuhn? My conclusion is that despite ongoing efforts to promote quality standards in this field, lack of proper validation is still a problem of many published simulation studies and that, at least large parts of social simulations must be considered as prescientific. Phelps, S. (2016). An empirical game-theoretic analysis of the dynamics of cooperation in small groups. Journal of Artificial Societies and Social Simulation, 19(2), 4. https://doi.org/10.18564/jasss.3060. ISSN: 1460-7425.